Battambang is a smaller town on a river southwest of Siam Reap. It’s known for it’s French Colonial architecture and was a wonderful place to spend a peaceful day. The previous night Rob and I finally mustered the energy to walk downtown, ~20 minutes. Rob caved to my desire for Indian food and we sought out a place recommended by Lonely Planet, Flavors of India. When we got to the address, it wasn’t there, so we continued wandering down a more major road nearby. Just when we started checking out menus for other places, I saw Flavors of India across the street. It had moved at one point. We proceeded to have a extremely large and good meal for $14 (palak paneer, eggplant masala, naan, tumeric rice, beer for rob and mango lassi for me). Flavors of India in Cambodia! Unfortunately, my stomach was still a bit on the fritz, so I couldn’t enjoy it completely. We joked that Rob knew I wasn’t feeling great because I gave him the last 1/4 of my mango lassi. Our tuk tuk driver came and picked us up afterwards. We paid him for the two rides so far and told him we weren’t going to hire him but instead bike around. Returning to home stay, we were greeted with a plate of amazing mango that overcame all stomach issues. Best mango yet! The next morning, we woke up early and had an amazing Cambodian breakfast at our guesthouse (we highly recommend Battambang My Homestay) before borrowing their free bikes (Rob’s was great, my front wheel didn’t rotate too well and required extra oomph) for a cruise around the city and a short ride out to the bamboo train, a dinky monorail about 1 km connecting two villages. The cars are made of bamboo so they can be disassembled when passing is needed. We decided against the $5 ride but it was fun to go check it out. Crazy good pancake thing with chicken, veggies and a vinegar based peanut sauce. 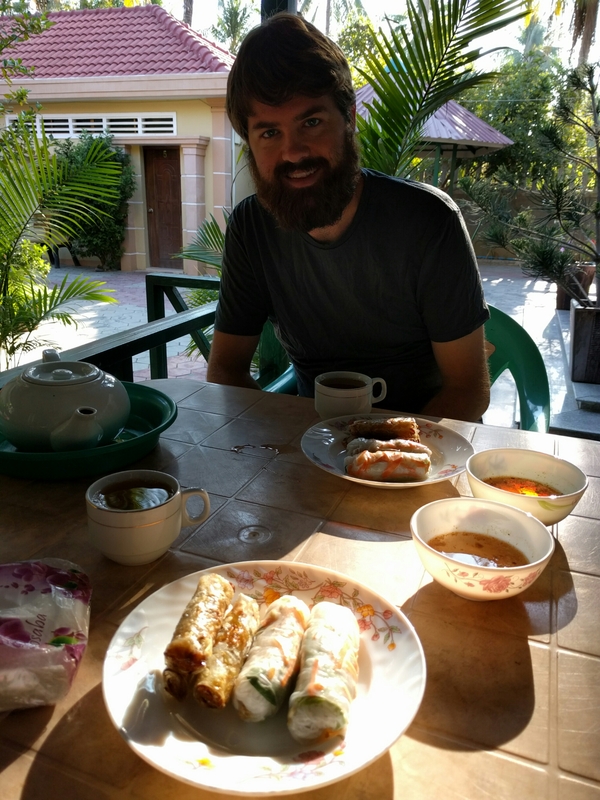 Cambodian breakfast is awesome! Returning to downtown, we grabbed lunch at a tiny “veggie” restaurant recommended by Lonely Planet. We were confused because both of our dishes had meat. We also tried some flavored soy milks (black sesame/peanut for Rob, pumpkin for me), which were pretty good. After lunch, we went in search of a quiet, shady cafe to spend a few hours. We found Alan and Peggy from the boat “cruise” in the best value beer place we could find ($0.50 drafts at happy hour) and ended up talking to them for a couple hours about traveling, history, and views on other countries. We would run in to them a few more times before leaving Cambodia. While we were there, another guy from the boat walked in. Tourist Battambang is small. Eventually, it was time to grab a quick street side bite and head north to the circus. We picked up our bus tickets to Phnom Penh en route to the show. The performances are held at a fine arts school famous for its acrobats and the older students show off their skills a few times a week to raise funds. Graduates do another show in Siam Reap that we missed. It was a fun show with some parts that left us confused about their “storyline” but the acrobatics were fun. We sat next to the same woman from France that we were next to on the boat ride. Circus School Performance. This guy is balanced on a series of cylinders. The next morning after a tasty spring roll (2 types) breakfast, we were off to Phnom Penh, the capital of Cambodia.